← Hidden Sugar Detox…. Should that be my New Year’s Resolution? The latest dietary guidelines call for us to get 10-13 servings of fruits and vegetables per day. Did your jaw just hit the ground? Yeah that tends to be the common reaction when I tell my clients that! Yet we know no matter what you are trying to improve, you can’t go wrong with getting more fruits and vegetables. But is getting 10-13 servings per day impossible? Well lets say even if we don’t get 10-13 serving per day, we certainly have lots of room for improvement! 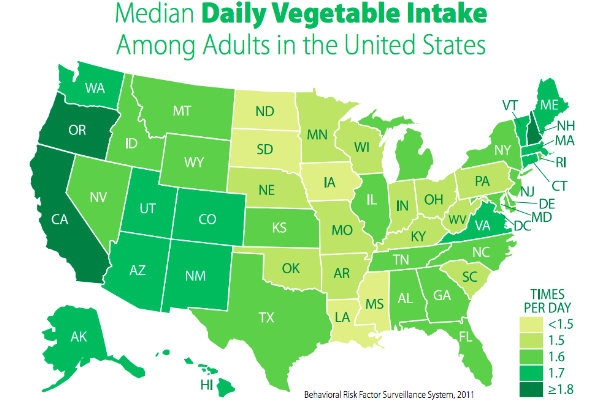 The CDC reports adults are averaging less than 2 serving of vegetables per day and less than 1.5 servings of fruit per day! First let us understand what a serving is and then lets figure out how you are going to get more! A serving is 1/2 cup cooked and 1 cup raw, or as I like to say a fist full (because who is measuring everything they eat). How are you going to get more in your day? 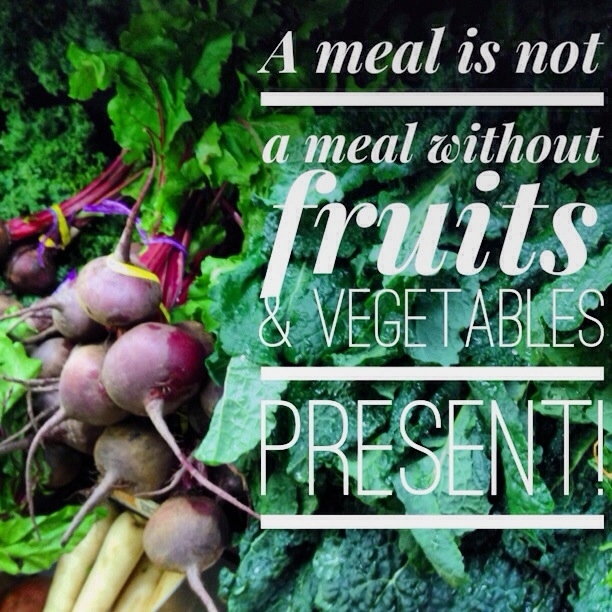 Your new motto: A meal is not a meal without fruits and vegetables present! Make lots and lots of soups! Busy week but them pre-cut and prepped! What does a days worth of Fruits and Vegetables look like? So 10-13 serving a day may seem like a great deal, but it is actually just about 6 cups. If you had a 3 cup salad each day, you have already hit the 1/2 way mark. When you see it below it may not look that bad or impossible to get! The way I look at this, is we all have room for improvement, so don’t get overwhelmed by the numbers. Rather take on the challenge with small steps by adding a salad here and there, finishing meal with a piece of fruit, swamping a yogurt for some carrots as a snack, making vegetables the main attractions rather than a side dish. One of my quick way to get more vegetables in, especially during the winter is crockpot vegetables soup. This soup is so easy and it only takes 3 steps… 3 Step Crockpot Vegetable Soup! This entry was posted in Meatless Mondays!, Planning, Quick & Healthy, Uncategorized and tagged Cooking, food choices, fruit, High Fiber, Quick, School Lunch, Snacking, vegetables, Weight loss, wellness group, youtube clip. Bookmark the permalink.